What Are the Benefits of Cranberry Juice for Males? Cranberries are the tart cousins of the sweeter blueberry. They are grown in North America and Europe but the versions grown in the Northern United States and Southern Canada are bigger and juicier than the cranberries grown in Europe. 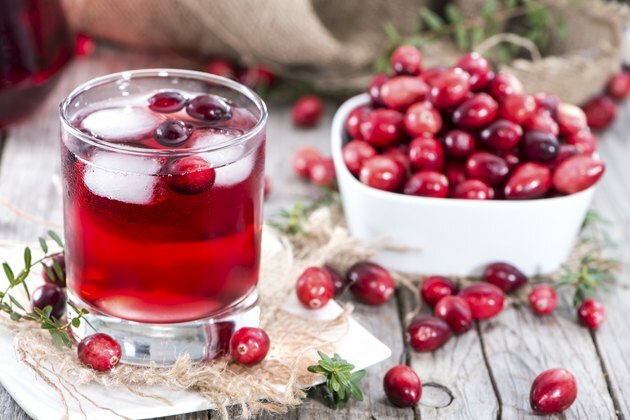 While cranberries have long been used by women, there are also specific benefits for men. Drinking 8 ounces of low-calorie cranberry juice increased the blood levels of high-density lipoprotein, or "good," cholesterol, according to a study done by the "British Journal of Medicine." HDL cholesterol has factors and characteristics that protect the heart. The study found that there was an 8.6 percent increase in HDL levels found circulating in the blood stream when the males in the test group consumed 8 ounces of cranberry juice. When the men drank a small amount -- 4 ounces -- there was no increase the HDL levels. Cranberry juice can have a beneficial effect on bacteria like E. Coli, which is associated with urinary tract infections. The cranberry juice prevents the free radicals from attacking the body. This is due to the presence of phytonutrients and flavonoids, which also are known to improve memory and help the immune system. Drinking cranberry juice regularly can help prevent prostate cancer. According to a 2007 study by the "Journal of Nutrition," drinking cranberry juice can prevent the growth of cells that can lead to prostate cancer. The study cited a double-blind trial that found found significantly lower levels of h. pylori infection in those that drank the juice regularly for a two-week period.